being little • bristol uk fashion & lifestyle blog. : ella. 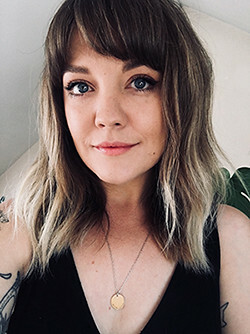 My name is Ella Masters, you will find me over at ella's blog, which is filled with D.I.Y tutorials, illustrations and fashion makes. I was rather chuffed when Lyzi asked me to share a little post with you lovelies whilst she is having fun at Bestival. It's a simple way to make a little something from practically nothing, perfectly lacy and beautiful. I will be taking you step by step through the tutorial.... let's begin. 1. You will need 30cm of large lace, 15 cm of large lace for the middle of the bow, thread, 1 hair clip, 1 needle and a pair of scissors. 2. Fold the large (30cm) piece of lace, so the two ends meet in the middle. 3. Pinch the middle of the folded piece of lace. 4. 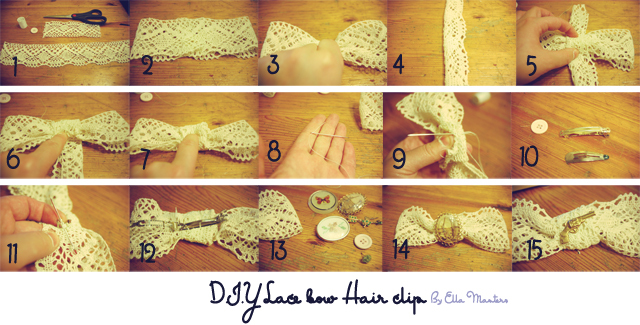 Take the smaller piece of lace (15cm) and fold it down the middle length ways. 5. Lay it over the top of the folded lace in the middle. 6/7. Lay the 15cm piece of lace(that is folded lengthways) across the middle of the bow, wrap it around the bow and then fold it over 4 times at the back. 8. Now thread your needle. 9. Sew the fold at the back together. 10. Now get your clips ready. 11. Lay the crocodile clip on the back, and sew through the little holes on either side. 12. Sew it securely across the clip. 13/14/15. For an added bonus I have collected up a few little ideas that would be great to give the bow a little something different - if you have a cute little brooch you could add it to the middle, and it's detachable so it's perfect, and can be changed with every outfit, or you could find a little brass stamp or a button and sew it onto the front. Voila! You have a beautiful unique hair accessory! hehe Ella on Lyzi's blog! love this little tutorial, I nay have to do it as i have so much lace that i always forget about! GENIUS! looks pretty easy too, even for diy newbs like me haha.